Small enough to take with you on outdoor adventures but big enough to do some real work in the backcountry, the Gerber 14 in. Hatchet offers a tough, sharp blade and a comfortable handle. 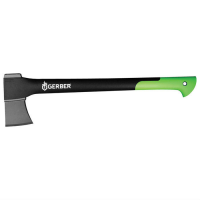 Expect clean cuts longer than average from the Gerber 17.5 in. hatchet. Delivering efficient strength in a slim profile, the PTFE blade coating and grind technique make the blade sharper than ever. The Gerber Airlift EFS folding knife offers a proven design for everyday carry. It stands up to the daily grind with all steel construction, and its durable frame lock can be operated with one hand. A distinctively different everyday carry, the Gerber Air Ranger G-10 folding knife features a G-10 handle that offers superior grip for deployment and use. Heading out into the wild? Stay prepared with the Gerber Bear Grylls basic kit. This 8-piece survival set comes in a waterproof nylon bag that's easy to stash in a glove compartment or backpack. Compact and indestructible, the Gerber Bear Grylls Compact Fixed Blade knife with sheath should be your survival tool that stays close at hand for quick day trips into the woods. Surviving the unexpected is about being prepared, and the Gerber Bear Grylls Sheath folding knife exceeds standards, and gives the ability to engage with your surroundings in perpetual survival mode. A survival knife for scouting, the Gerber Bear Grylls Scout drop-point, fine-edge knife offers a surprisingly tough drop-point blade, that's ideal for cutting rope and edge retention.